InfoSewer/Pro conceptualizes a sewer collection network as a collection of links connected together at their endpoints, called nodes. The nodes represent manholes, wet-wells, and outlets while the links represent pipes and pumps. The sewer system can be of any topological configuration and can contain multiple loops and outlets. Manholes represent points in the sanitary sewer system where loads enter into the system. Manholes are normally located at places where pipes connect and where pipe characteristics such as diameter and slope change. Outlets designate discharge points (e.g., treatment plant, ocean outfall) where flows exit the system and are the most downstream points of the collection system. Wet wells are structures in the collection system that collect wastewater flows before they are pumped into force mains for transport to another gravity system. Pipes are circular conduits by which flow is transported either by gravity (i.e., gravity mains) or by the energy supplied from pumps (i.e., force mains). Pumps are devices that raise the hydraulic head of water through the sanitary sewer system. How InfoSewer/Pro models the hydraulic behavior of each of these physical components is reviewed in the following sections. For the sake of discussion, all wastewater flows are expressed in cubic feet per second (cfs), although the program can also accept flow units in gallons per minute (gpm), million gallons per day (mgd), imperial million gallons per day (imgd), acre-feet per day (afd), cubic meters per hour (cmh), cubic meters per day (cmd), million liters per day (mld), liters per second (lps), or liters per minute (lpm). Wastewater represents the spent or used water from residences, commercial buildings, industrial plants, and institutions, together with minor quantities of ground, storm and surface waters that are not admitted intentionally. The manhole diameter and rim elevation parameters are used in the determination of manhole surcharge and flooding. The loads on the system, i.e., wastewater flows collected, accumulated and conveyed by the collection system are assumed to be positive. Manholes can have their load vary with time and different types of loading (e.g., low density residential, medium density residential, high density residential, industrial, commercial, etc.) can be assigned to them. A manhole can also have no loading defined. · Junction chambers represent nodes in a pressurized sewer collection system connecting pumps to force mains. No loads can be defined for a junction chamber. · Outlets designate facilities where flows exit the collection system. These nodes define the discharge end or the most downstream element of a sewer network. The exit condition can be grouped into four cases as shown below. · Fixed flow split percentage method – The user specifies the percentage of the total flow in the manhole which is assigned to each of the downstream pipes. · Variable flow split percentage method – The user defines a curve representing the percentage of the total flow in the manhole which is assigned to a downstream pipe as a function of the total incoming flow (See CURVE section). · Inflow-outflow flow split method – The user supplies an inflow-outflow curve for each of the downstream pipes splitting from a manhole. The curve defines the amount of the incoming flow to be diverted to a downstream pipe. This flow split method is designed to accommodate flow conditions where hydraulic structures such as weirs and dams are used to regulate downstream flows. · Automatic flow split method – InfoSewer/Pro automatically computes the fraction of the total flow in the manhole assigned to each of the downstream (outgoing) pipes based on their invert levels and diameters. Note that InfoSewer/Pro checks that the sum of the fractions leaving a manhole equals 100 percent. In case, the sum is less or greater than 100%, InfoSewer/Pro will automatically adjust the flow allocations for the outgoing pipes proportionally to satisfy flow balance. Finally, note that InfoSewer/Pro assumes that a pipe is closed if its flow split percentage is zero. Manhole structures can induce backwater effects to their connecting sewer pipes. However, the precise hydraulic description of the flow in manhole structures is complicated because of the complex degree of mixing, separation, turbulence, and energy losses. These losses are commonly estimated as a function of headloss coefficients and are used to calculate hydraulic grade lines for upstream pipes during backwater analysis. K = headloss coefficient (unitless). Wet-wells are required to operate within their minimum and maximum levels. A wet-well can be modeled as a constant diameter (cylindrical) where a representative diameter is specified as the diameter corresponding to the average wet-well area. In case a wet-well can not be adequately described by a representative diameter, InfoSewer/Pro allows you to define data for the stored volume as a function of depth of wastewater using a curve (see CURVE section). This allows wet-wells of any shape (variable cross-sectional area) to be accurately modeled. Pipes can either be gravity mains or force mains. The main difference between the two is the hydraulic equation utilized for flow computation. The Manning equation is employed for gravity mains while the Hazen-Williams equation is used for force mains. InfoSewer/Pro assumes that a force main is always connected directly downstream of a pump. InfoSewer/Pro offers a number of useful methods to model infiltration including: count-based (e.g., defect-based), pattern-based, pipe surface area-based, pipe length-based, and pipe diameter length-based. InfoSewer/Pro also models parallel pipes with the assumption that all parallel pipes are identical with the same characteristics (i.e. diameter, slope, length and coefficient). The value of the Manning coefficient depends on the condition of the pipe and is therefore somewhat analogous to the pipe roughness used in pressured pipe networks. D = pipe diameter or conduit depth for circular and non-circular shape types, respectively. The unit is in ft (m). k = constant (10.7 for SI units, 4.727 for US units). 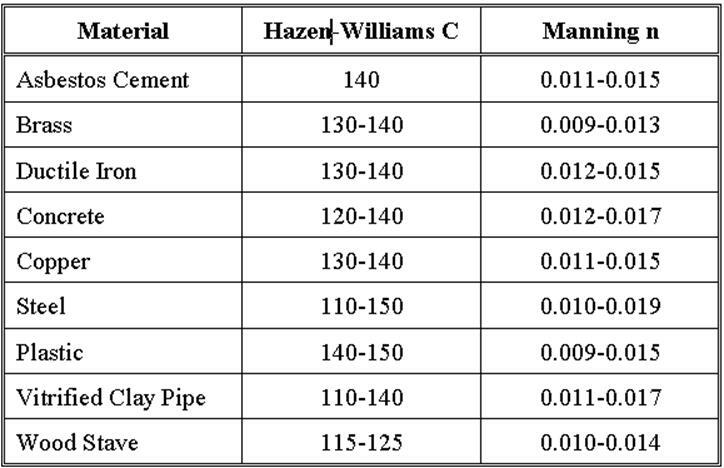 Typical average design values of Manning and Hazen-Williams coefficients for commonly used sewer pipes (newly installed) are listed in the table below. Be aware that the roughness coefficient depends on the pipe material, pipe size, depth of flow, flow characteristics, and condition of the pipe and can change considerably with age. where P represents the wetted perimeter, ft (m). In the calculation of the hydraulic radius, the net cross-sectional area should be evident from the geometry of the section. The wetted perimeter is defined as the sum of the length of the boundaries of the section actually in contact with the water. The term on the left side of the above equation is solely dependent on the geometry of the section. Therefore, for a given discharge (Q), slope (S), and surface type (n), the flow depth in the gravity main can be determined. This depth is called the normal depth. The normal depth of a force main is equal to its diameter. · Full Flow: represents the flow when the pipe is full, i.e. where the wetted perimeter is equal to the entire pipe perimeter. · Maximum Flow: represents the maximum theoretical flow occurring in a pipe when the normal depth is equal to 0.938 x Diameter. Any increase in depth will decrease the flow, which is why the full flow is less than the maximum discharge for a circular pipe. · Analysis Flow: represents the flow occurring in a pipe as derived from the analysis criteria curve (See CRITERIA CURVES section). A pump is a link that imparts energy to a fluid thereby raising its hydraulic head. Pumps are needed in a gravity sewer system to prevent deep excavations, and are designed to lift the fluid to a desired level that produces gravity flow condition further downstream. · Fixed Capacity representing a fixed pump flow. The pump flow is set to the fixed capacity and is independent of the flow entering the wet-well. It is assumed that the flow will transfer at the fixed rate, independent of the head requirements. · Single-Point Curve – A single-point pump curve is defined by a single head-flow data point describing the desired pump operating point (design point). InfoSewer/Pro assumes that the cutoff head (at zero flow) is 133% of the design head and the maximum flow (at zero head) is twice the design flow. It then treats the curve as a three-point curve. The computed results for pumps are the flow pumped and the head gained. By definition, the original pump curve supplied to the program has a relative speed setting of 1. If the pump speed doubles, then the relative setting would be 2; if run at half speed, the relative setting is 0.5 and so on. 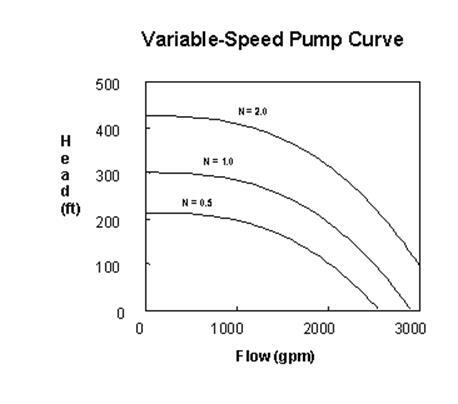 The figure below illustrates how changing a pump’s speed setting affects its characteristic curve.